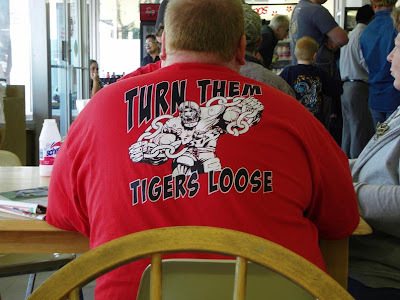 I saw quite few Tiger playoff T-shirts around town this morning. Brian and I are off to Midlothian, TX to watch the Terrell Tigers playoff football game. I am hoping to have lots of pictures. If you are unable to attend today's game between Terrell and Waco University you can follow the game on radio and on the web. RADIO: Casey Wiley (play-by-play) and Cliff Gibson (color commentary) from KPYK 1570-AM will carry the game live beginning with the pre-game show at 1:30 p.m.